Every now and then, I pick up a tub of Potted Shrimps from Waitrose. They make a tasty little snack, spread onto hot toast, or stirred into some scrambled egg. 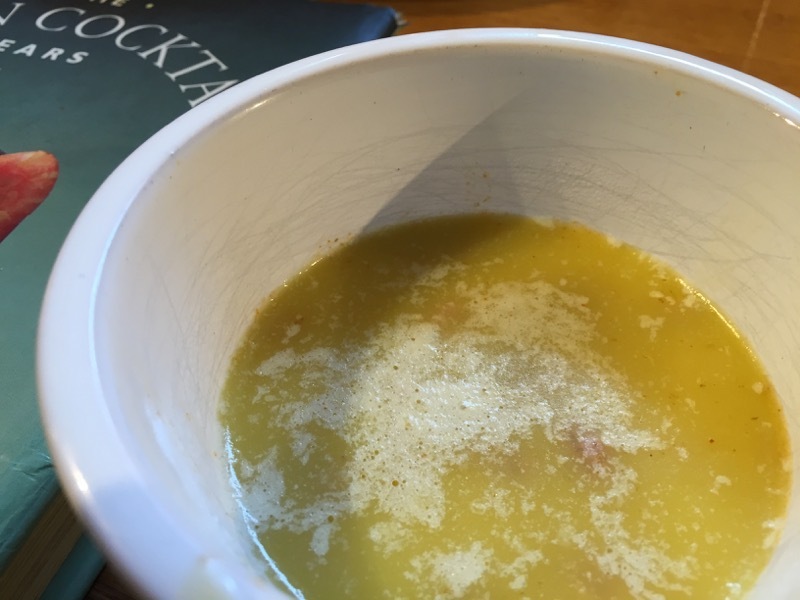 Just like the previous recipe, Scampi with Tartare Sauce, it’s something I’ve never considered making myself – I guess it just feels so much easier to buy the ready prepared version. 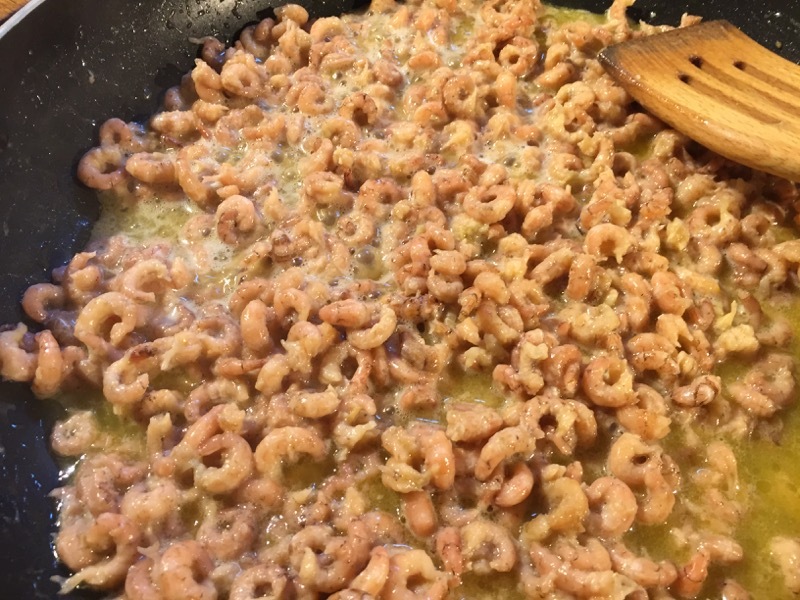 I mean, they’re just shrimps in butter – how different could they be if I made them myself? It all starts with some peeled brown shrimps. I had ordered some from The Cornish Fishmonger along with my langoustines for the scampi. They come in packs of 100g, so I ordered three. I was a little disappointed when I unpacked the box to find that there was only one pack in there. I checked the invoice – it definitely said there should be three, but there clearly weren’t. 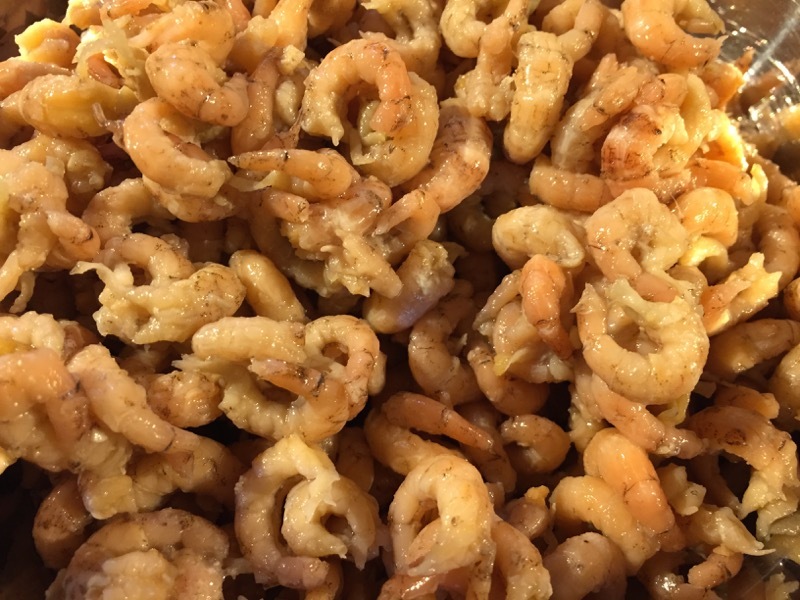 I emailed the company and complained – to their credit, they replied very promptly apologising for the mistake and refunded my money, but that still left me with an acute shortage of shrimp. It certainly wasn’t worth trying to pot this meagre amount. Waitrose to the rescue. I nipped into town, and they had a few packs of brown shrimp on the shelf. I snapped them up. So, the recipe is very straightforward. 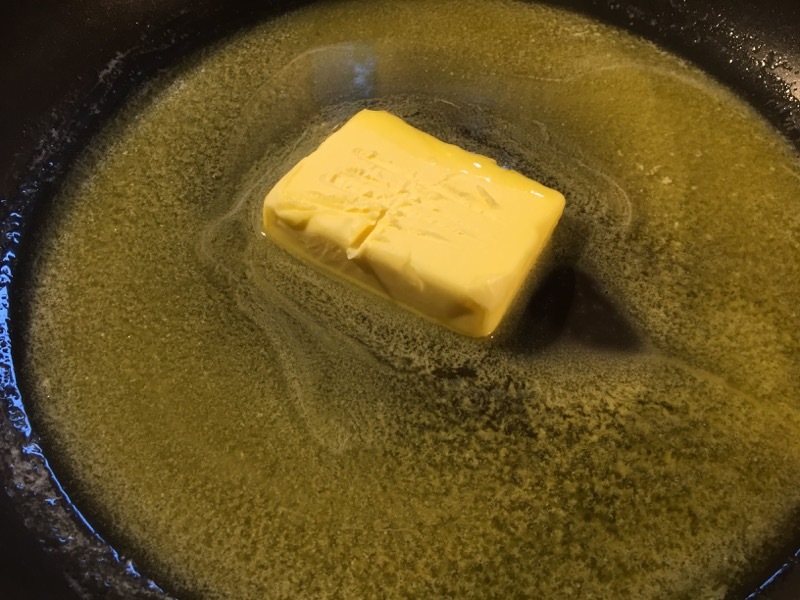 I melt some butter in a large frying pan. Add the shrimps and stir them around until heated through. Finally, I add some salt, mace, nutmeg, cayenne and lemon juice, stir well, and remove from the heat. Now for the actual potting. I take six ramekins and divide the shrimps and the buttery liquid between them, pressing down lightly. 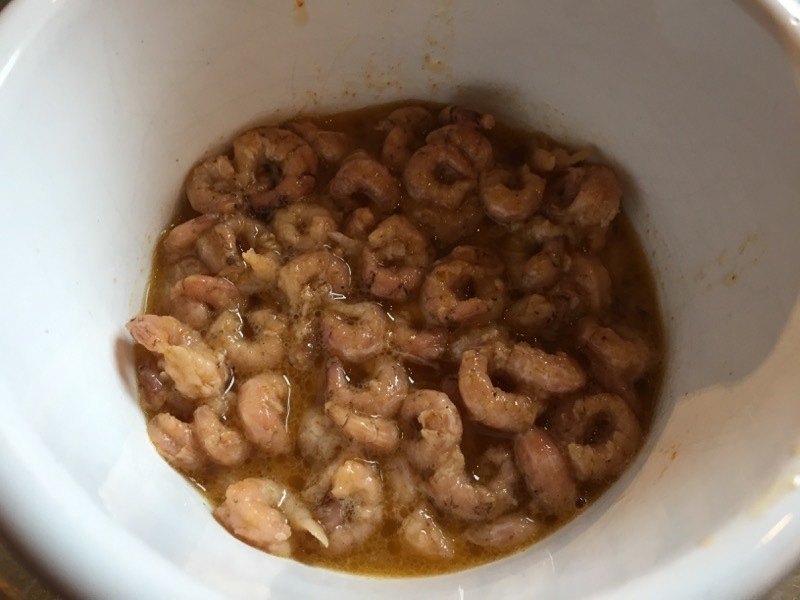 These ramekins a little on the large side for this amount of shrimp, but they’re all I’ve got – they’ll have to do. Once the shrimps are cool, I melt some more butter and pour over the top of the shrimps until they’re sealed in place. The shrimps are now potted and I put them in the fridge to set. We eat the first batch of shrimp the following morning for breakfast – one ramekin each and some hot toast to spread it on. It is delicious. I quickly realise that the shop-bought version is so vastly inferior to this. It’s the spices that make it – that nutmeg-mace flavour works perfectly with the shrimp. Each bite, through the soft buttery shrimp and the crisp toast is delightful. I’m so pleased we still have another four pots of these in the fridge. I’ve only had this dish once before and they were bought from Waitrose. They were quite nice but nothing leapt out at me. However Dave potted his own and they were SCRUMPTIOUS! A delicious nutmeg and butter flavour along with the shrimp, which were soft and tasty. 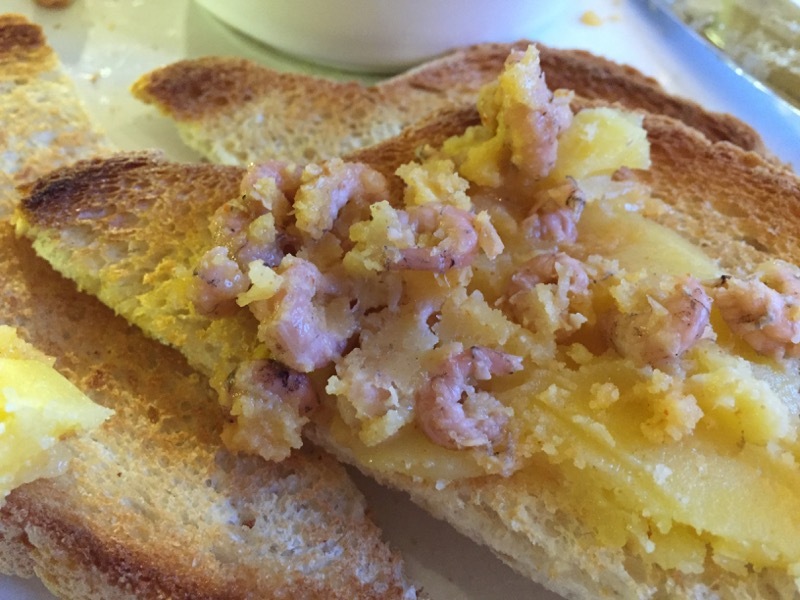 We spread our shrimps and the butter that sealed them into their pots, onto toast and it was wonderful. A really good lunch, breakfast or just darn good snack. He’s on a roll. This is another 10/10 meal. Sounds amazing! loved reading about this one a lot!